Under the direction of Angus Campbell and Robert Kahn the Survey Research Center (SRC) at the University of Michigan carried out what it viewed as a pilot study of the national electorate. 1948 provided the trial for the method. ANES was the first to employ the Kish grid. Beginning 1948, table selections A, B1, B2, C, D, E1, E2, F were printed on one batch of otherwise identical “coversheets.” Coversheets were randomly assigned to interviewers from the batches. The Kish grid was used through 2000. Visual aids for respondents began in 1952 with different color cards for lists, scales, or thermometers created by typewriters and hand-drawn lines. Eventually, in the 1990s, output via PC software was a great leap, though now dwarfed by that of today’s programmed media. 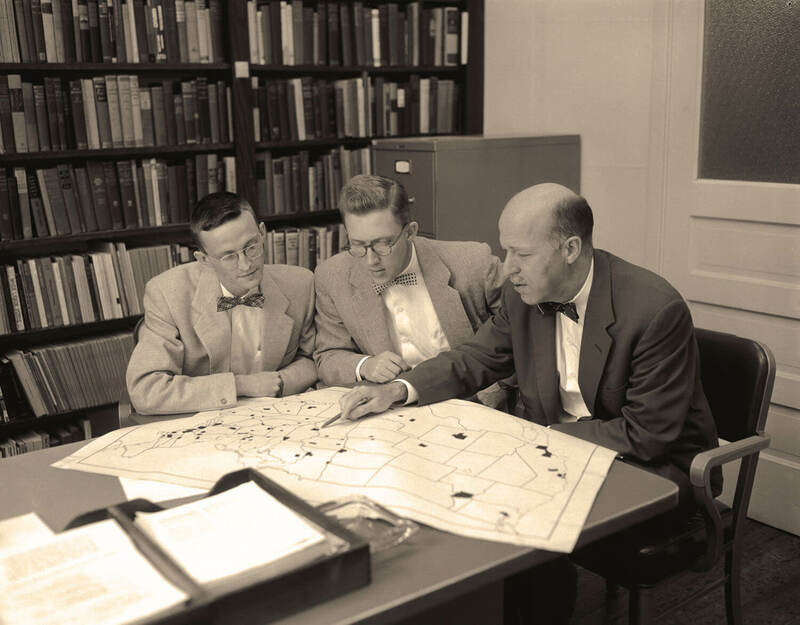 In 1951 Warren Miller is hired as the assistant director of the Survey Research Center. His dissertation is a proposal for a project that soon becomes adopted almost in entirety in the 1952 National Election Study and then in long-term planning for further studies that would become known as ‘the Michigan Election Studies‘. The American Voter is published. Using data from the first three studies it becomes a seminal study of voting behavior in the United States. The Feeling Thermometer measure is first introduced. It has been used by ANES and research studies around the world ever since. The first oversample of Black respondents is included. The first Latino oversample was included in 2008. The National Science Foundation funding constituted a mandate to transform the Michigan Election Studies into a truly national resource, with members of the research community who use these data actively participating in their further development. A wide and diverse set of social scientists have participated in every facet of ANES activities, from definition of the time series data to innovations in study content, design, and instrumentation. Harvard publishes the American National Election Studies Data Sourcebook 1952-1978. Providing tabular percentages across years for measures repeated comparably over multiple Time Series studies since 1952 it is the predecessor to the online ANES Guide to Public Opinion and Electoral Behavior. This publication effort also produces the forebear of the eventual Time Series Cumulative Data File the most downloaded dataset in the ANES archive. The first full telephone interviews conducted by NES were administered by interviewers who recorded responses on paper questionnaires. The first CATI interviews. A design for comparison of telephone versus face-to-face interviewing modes was implemented in the 1982 Methods Comparison Study. Pre-election and Post-election questionnaires were produced in both English and Spanish versions for the first time. Spanish questionnaires were used again in 1994. In 2008 and 2012 Spanish-language instrumentation was programmed together with the English-language instruments. The 1996 Election Study was the first to incorporate question content from the cross-national Comparative Study of Electoral Systems (CSES). ANES has since participated in all modules of the CSES which has grown to a project in over 54 countries around the world. NES provides archival and dissemination services for the Florida Ballot Project an effort to catalog the contents of 175010 Florida ballots that did not register a vote for president of the United States in November 2000. The National Election Studies becomes the current American National Election Studies and begins a collaborative effort between the Institute for Social Research at the University of Michigan and the Institute for Research in the Social Sciences at Stanford University. The Online Commons was inaugurated to encourage submissions from the research community that provide new ideas and improves the quality and scientific value of our studies. Funding is sought for the 2016 Time Series Study under the direction of Principal Investigators Vincent Hutching and Ted Brader at the University of Michigan and Simon Jackman and Gary Segura at Stanford University.